the paragraph applies also to low phase noise crystal oscillators. 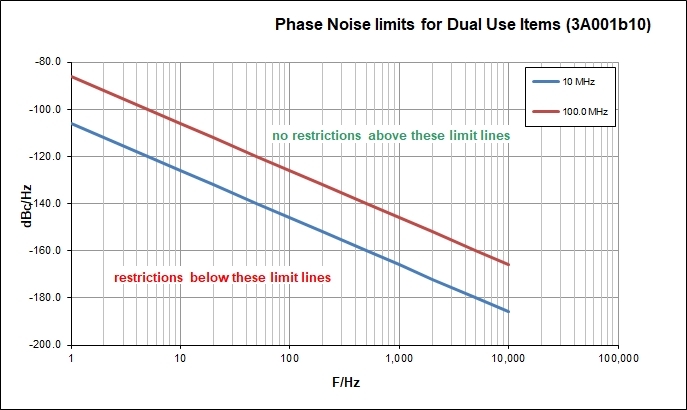 In the attachment I have added a chart showing the limits for 10 MHz and 100 MHz. I have no idea, where I could place my arguments to advocate a change of this unrealistic regulation. Indeed it may be good that not all customs officers are able (or have the time) to solve that equation. > >and India. Perhaps a larger opportunity for a RB reference today. As far as I can tell, there is no explicit mention of atomic clocks. But the list of dual use electronics is long and broad. E.g. Section 3. A. 1. b. 10. covers basically all low noise frequency sources. Including just a simple low-noise XO.